Keeping your barge in tip-top condition is essential if you want to ensure that you can enjoy it for many years to come. 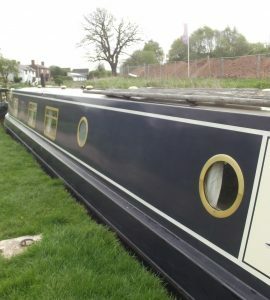 The exterior of a barge is often one of the first things to start looking a bit run down. Reviving a boat’s exterior will not only help to make it look as good as new, it is also a vital piece of work that it’s highly recommended barge owners should perform, as part of their boat’s maintenance needs. Polytrol restores the color and appearance of dull and faded surfaces caused by rain, sunlight and pollution. It is a deep penetrating oil which dries to a tough and long-lasting flexible finish, that won’t peel or flake. Plus, it’s surprisingly simple to use. It’s important that you remove any dirt, grease, grime or mildew from the surface you’re going to apply Marine Polytrol to. You can treat mildew by scrubbing a 50:50 bleach and water solution onto the surface of your barge and leaving it to stand for around 10 minutes, before rinsing thoroughly. Any waxes or polishes (or similar substances) or silicone, should be completely removed too. It’s important to work in areas that you can complete in 10-20 minutes, so that you end of up with an even appearance. Simply apply Marine Polytrol with a brush or cloth and leave it to work for 10-20 minutes. Wipe off any excess product with a lint-free cloth before it gets tacky. If you want a really shiny finish, you can buff the surface with a lint-free cloth. Now, you should leave it to dry. If, immediately after you have applied Marine Polytrol, you find that there are some matte and shiny patches, you will need to move any surplus product to the matte areas. We always love seeing our customers’ before and after photos, so we were very pleased when one of our customers got in touch to say what a difference Marine Polytrol had made to their boat. Have you recently completed a project you’d like to tell us about? Get in touch today – we’d love to see your before and after shots, too, if you have them.